In August 1942, more than 2,400 Jews were marched from Shumsk's wartime ghetto to pits dug close to the banks of the Vilia River, where they were shot by a German Einsatzgruppe unit with support from Ukrainian sympathists. 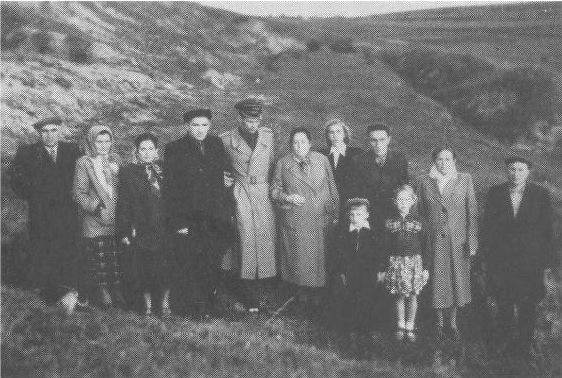 Here is an image from page 312 of the Shumsk Yizkor Book of a group of Jews originally from Shumsk visiting the site of the mass grave in September 1956. The adults pictured in the above picture are, from left, Moshko and his wife, Sasha; Sara Chusyd and her husband, Avraham Chusyd; a Polish military officer who accompanied the visitors; Sarka Berensztejn-Fiks; Shalom Krakoviak and his wife; and Shmuel Shafir and his wife. The children are the Chusyds’ son and the Krakoviaks’ daughter Ora. In 2006, the memorial at the site was cleaned up, and a new marker was installed. Another cleanup was completed in 2017. Click here for photos and more information (many thanks to Lynne Tolman). 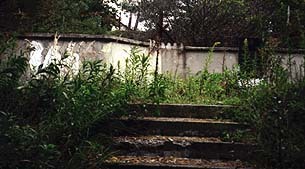 Here are photographs of the memorial as it looked in 2009, taken by Ann Roman. Below is an account of Howard Freedman's visit in 1999, before the memorial's restoration. My translator, driver, and I were brought along a long and unmarked path to the mass grave by two elderly Ukrainians whom we happened to run into as we were searching for the site. Both had witnessed the liquidation of the Jewish ghetto and execution of the city's Jews. This is the forested path walked by Shumsk's Jews to their death. It was paved when a memorial was established at the execution site. This man had witnessed the events from the fields adjacent to the site. He stated that, once covered, the pits rumbled with the movement of those who were still alive for days. At the time of my visit, the memorial erected to the dead at the execution site was badly overgrown. 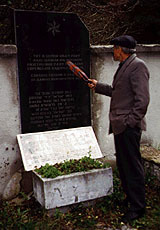 A memorial stone in Ukrainian and Hebrew was created several years ago.